My left foot has hurt the last few weeks. I've been ignoring it as best as I could. But I finally went to the doctor on Wednesday and had what I already knew confirmed. This time it's my #2 toe. You can't see in the picture, but the bone is "fuzzy" all the way down on both sides. Not good. So I'm out for six weeks. which means that all of the crazy hard training, getting up at 4:10am and so forth will not be used for the Fort Worth Marathon. Doctor's orders are NOTHING running related for 2 weeks, then I can run 1 mile IF there is no pain. I go back in 4 weeks for an evaluation. The goal is to be able to run a 10k in December, a 1/2 in January and a full in February. UGH. But what can I say, I did this to myself. I upped my training and as I had been saying, IF I could remain healthy, it was going to be great. I'm stronger and faster. But I knew that I was playing a gambling game running 6 days a week and logging a ton of miles. So I'm going back to the Galloway method. I used Jeff Galloway's method and ran half a dozen or more half marathons plus a full marathon injury free. 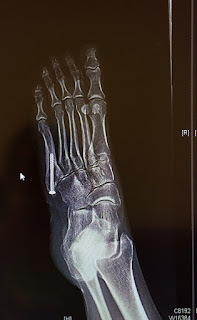 I changed plans to run for a time goal thinking I needed something more ambitious and ended up with a stress fracture on the left foot after Austin. And here I am 8 months later with another stress fracture on the same foot, different toe. So, I'm telling myself to STOP IT! Galloway's plan is for injury free running. That should be my goal. That is my goal. Cause I have to say, going into the holidays not being able to run off stress and food is hard! But I am determined to get my foot pain free and I'll them be back on my training plan. this time I'll just be smarter with it and use Galloway! My article is in Arts and Activities Magazine!! Have you tried Google Drive?